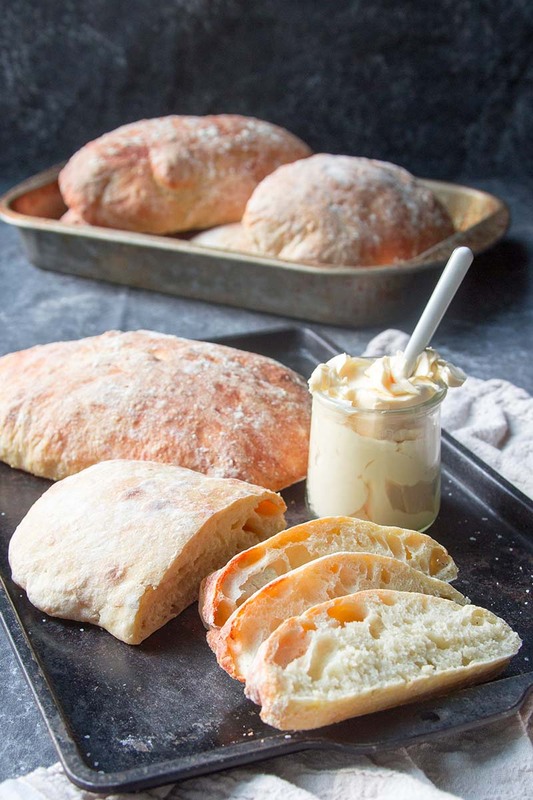 Make authentic ciabatta bread at home with this recipe! Ciabatta bread is a classic Italian style bread that translates to mean “slipper bread” due to the shape of the loaves. Ciabatta is a chewy and uniquely moist bread made with a preferment called a biga, which greatly enhances the flavor of the bread. Make the Biga: At least 12 and up to 24 hours before making your ciabatta, make the biga. In a large mixing bowl, combine the ingredients for the biga and stir together. Cover the bowl with plastic wrap and let it stand at room temperature for 12-24 hours. Combine the Dough: Add the rest of the ingredients for the ciabatta dough into the bowl with the biga. Stir until well combined. It will appear as if there is not enough liquid at first, but as you work it together it will become a very wet and sticky dough. You may need to use your hands to knead it slightly to hydrate all the flour. As soon as all of the flour is hydrated with no dry spots, cover the bowl with a piece of plastic wrap and let it set at room temperature for 45 minutes. Stretch and Fold: After the dough has rested for 45 minutes, you will do a series of three stretch and folds with the dough. With the dough still in the bowl, lightly dampen your hand (this will prevent the dough from sticking) and pull on one side of the dough and stretch it up and then fold it down over the top of the dough. Rotate the bowl 90 degrees and do the same with the next side. Do this again until you have stretched all four sides of the dough up and over on itself. Cover the bowl and let it rest for 45 more minutes. Stretch and fold the dough for the second round. Cover and let rest for 45 more minutes. Stretch and fold for the third round. Cover the dough and let it rest for 45 more minutes. This is a three hour process from when the dough is mixed to when it is ready to be shaped. Four 45 minute resting periods with three stretch and folds in between. Prep the Oven & Other Equipment: During the final resting period, prep your pans and your oven. Position one oven rack in the very bottom position in the oven and another rack in the middle position. Place a cast iron skillet or another heat proof skillet on the bottom rack and a baking stone, baking steal, or a sheet pan turned upside down on the middle rack. Preheat your oven to 450°F (230°C). You want your oven and pans to be heating for at least an hour before the bread goes into the oven. Additionally, prepare a pizza peel or an unrimmed baking sheet with a piece of parchment paper sprinkled lightly with semolina or cornmeal. Let the Dough Rise: Lightly flour the top of the loaves and then cover with a floured towel. Let the dough rise for 1 hour. Bake: Fill a small bowl with about 2 cups of ice cubes. You want to work quickly and carefully when transferring the ciabatta. Open the oven and carefully & gently slide the whole piece of parchment paper with the ciabatta onto the preheated baking stone or sheet pan. Quickly pour the ice cubes into the preheated skillet and immediately shut the oven door (this will create steam). Bake for about 30-35 minutes or until the ciabatta loaves are a light golden brown and sound hollow when tapped. Cool: Allow the ciabatta to cool on wire rack before slicing. This will completely develop their flavor. Ciabatta is best when eaten the same day. However, leftover ciabatta can be wrapped in foil once completely cooled and kept at room temperature for up to 2 days.